Heidi Cunningham, Farmington Community Education Director accepted a donation for youth scholarships from the Louis Schmitz Foundation on Friday, June 19. The presentation was made at the beginning of the annual Louis Schmitz Memorial Golf Classic Tournament, held at Southern Hills Golf Course in Farmington. 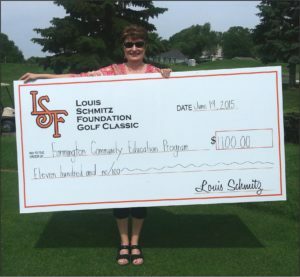 The Louis Schmitz Foundation was established in honor and loving memory of Louie, a local man that coached and mentored many young children in the Farmington area. The Louis Schmitz Foundation donated $1100 to Farmington Community Education to support needy youth and families so they can participate in Farmington Community Education youth sports and youth enrichment programs.